You’re very lucky its Thanksgiving and that I promised ya’ll this recipe in the next posting. This is sacred to me…very sacred…feel the love. My source for heritage apples is and always will be Vintage Virginia Apples. You can visit them at www.vintagevirginiaapples.com. They are fantastic people and have other good stuff for ya. Tell Ms. Charlotte I said hello! This recipe is my mother, Patricia Townsend’s own. I’m mister heritage apple and all that but my mother is a master cook. Since its Thanksgiving time, I figured it was time to put this up because it will be made! Peaches are the replacement in the summer with some spice and flavor adjustments, but the crust as we call it remains the same. The streusel topping screams Germany, but the taste screams Soul. I like using good Southern apples for this dish and making sure all the ingredients are top notch because its so simple and complete as a recipe. The fewer the ingredients, the better they need to be. This particular crisp was made up of Detroit Reds, Albemarle Pippins, and one or two apple varieties I don’t really remember LOL! I brought a bunch back from Monticello and there was some of this and that in my bag! This much I know—my friend, Tom Burford, a scholar, a gentleman, a master storyteller and probably the living bible of apple varieties once told me it takes four or five different apple varieties to make a perfect apple dessert. Something tart, something sweet, something fragrant and something with an interesting texture. You can feel free to mix standard market varieties with heirlooms but do your research. Make sure you have the taste balance that doesn’t overemphasize one of those flavors over the others. I make my own vanilla from year to year with vodka or clear rum with Tahitian or Madagascar vanilla beans—if I don’t see the speckles its not vanilla. If you’re really into the vanilla part of the deal–use vanilla sugar—put a few precious beans in a lot of sugar and use it sparingly. Mix together and sprinkle over apples. 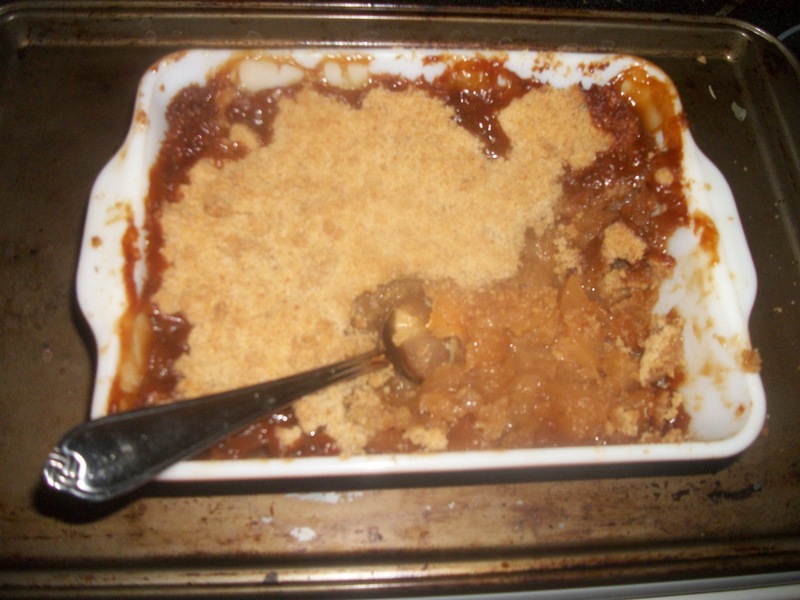 Mix by cutting together in flour/sugar mixture until you get the dough to a consistency of peas or until it is well blended and when squeezed by the handful it will stick together then break apart into a crumble. Sprinkle over apples. Bake for 35-40 minutes in the middle rack making sure to put something under the baking dish to catch any spillover. Quickie version–microwave the apples with plastic wrap on the top to steam them–ten minute or so until soft, then stir. Bake for half the time at the same temp as above. Do not let the topping burn! Golden brown does not mean burnt! Please remember that Facebook button and consider contributing to our long term survival here! Blessings, Michael .